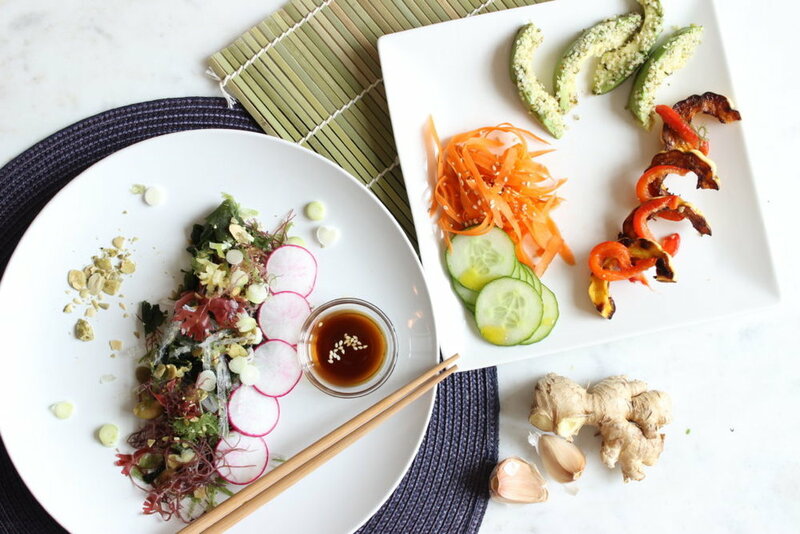 Deconstructed Seaweed Salad — Indulge in your health. What I love about this seaweed salad recipe is that incorporates so many colors, and healthy fats, but because it is plated uniquely, it looks elegant and decorative. Although there are quite a few ingredients, they require very little maintenance. It’s the perfect appetizer for a date night in. Serve it up with your favorite sushi rolls, rice, and kimchi. Preheat oven to 425 degrees. Spray a baking sheet with cooking spray, or use non-stick foil. Lay out delicata squash pieces and then lightly sea salt, then drizzle with coconut aminos. Baked for 12 minutes, and then flip. Baked for another 8-10 minutes, or until both sides are browned and you can easily pierce squash with a fork. In a medium mixing bowl, seaweed salad, toasted sesame oil and rice wine vinegar, then sprinkle with pumpkin seeds, scallions and radishes slivers. In a tiny bowl, add hemp seeds. Using clean hands, pick up each avocado wedge and dip 1, or both sides into hemp seeds. Plate. On the same plate, lay out each delicata squash and top with a bell pepper sliver. In another corner of your plate, add carrot slivers and sprinkle with sesame seeds, and then finally add cucumber slices. Optional, add just a touch of sesame oil to carrots, squash and cucumbers. Use chopsticks and have a little fun adding ingredients to each bite of your seaweed salad.